Greetings bloggy friends! I hope today finds you well. My question today is simple: How long have you been blogging/reading blogs? My Answer: I've been blogging since April 2008 with lots of ups and downs. I really hit my stride last summer and my stats went way up. I felt giddy. But it was rather short-lived as my family and homeschooling responsibilities were difficult to keep up with while I devoted all that time to blogging. Lately my blogging has been put on the back burner, and my blog is limping along. How I wish there were more hours in the day...but for now, I have to focus on my families' needs and settle for blogging occasionally. How about you? 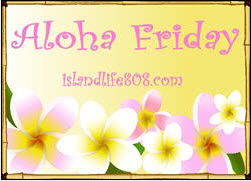 Be sure to visit An Island Life for more Aloha Friday Fun. Thanks for stopping by and have a wonderful weekend! I've been blogging since Nov 2008. I didn't realize it had been that long until I looked it up! Just about a year. So, I guess that still makes me a newbie! Funny you should ask. This Sunday it will be my One Year Blogversary! Woo Hoo! Since January of 2009 I started writing mine, but I have been a reader since 2007.